Arment Dietrich often tries its communications strategies on its own staff before offering those services to its clients. One idea the agency had was to position CEO Gini Dietrich (pictured) as a thought leader on various business issues. After researching articles and blogs ranging from top business publications to industry-specific outlets, the agency set out to find the right opportunities for Dietrich. 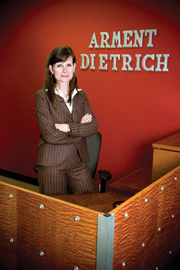 The overall goal was to position Dietrich as a business thought leader. Much research was required to do so, and the agency studied a wide variety of media outlets in the process. “As people started talking about social media and blogs, we were trying to figure out a way to get into the conversation, and so we started this to respond to blogs and to get comments out there in terms of proactive media relations,” Dietrich says. The agency focused on flagging articles and blog posts in top online business publications and industry-centered trade media that presented an opportunity for Dietrich to join the discussion. The agency then expanded the effort to other sites. The effort was effective in developing new relationships with media outlets. It saw 36 blog responses run since last June, and Dietrich was chosen as the “response of the day” on BusinessWeek.com twice. The agency's Web site also saw an increase in traffic. It is now employing the same strategy for three of its clients. Arment Dietrich has expanded the digital nature of the campaign to include Twitter.